the beneficial warming at the end of the 20th century to the Modern high point has been transmuted into the “Great Man-made Global Warming Alarm”. interglacial periods have varied both in temperature intensity and duration. On occasions some earlier interglacial periods were significantly shorter than the 10,000 year norm. The Antarctic based EPICA and Vostok Ice Cores above mostly show good accord for the last 200,000 years. Earlier there seems to be a similar pattern but with some significant time displacement in the period between 200,000 and 450,000 years ago. Those two Antarctic records are not so well coordinated during the recent Holocene period. This repeating pattern of long periods of glaciation, (~100,000 years), when much of the Northern hemisphere is covered by ices sheets several kilometres deep. These are followed by much shorter warmer inter-glacial periods, (~10,000 years), is driven by the orbital geometry of the earth around the sun. It can be modulated by the shorter term periodic behaviour of the sun. These facts controlling the earth’s climate are well documented and well understood. Prior to the current Holocene epoch a period of deep, encroaching, glaciation had persisted for the previous 100,000+ years as shown by the four Greenland records. Such long periods of glaciation meant that a mile high ice sheet covered New York as well as much of the currently inhabited Northern hemisphere. Those glacial conditions can and will return. On past experience, at about 11,000 years the Holocene interglacial must be approaching its reversion back to a long period of full glaciation. That ~110,000 year long period of glaciation was preceded by the Eemian interglacial period. The Eemian epoch was at its warmest about 120,000 years ago. It was some +3°C warmer on average than the Holocene “Climate Optimum”, of just some ~8000 years ago. 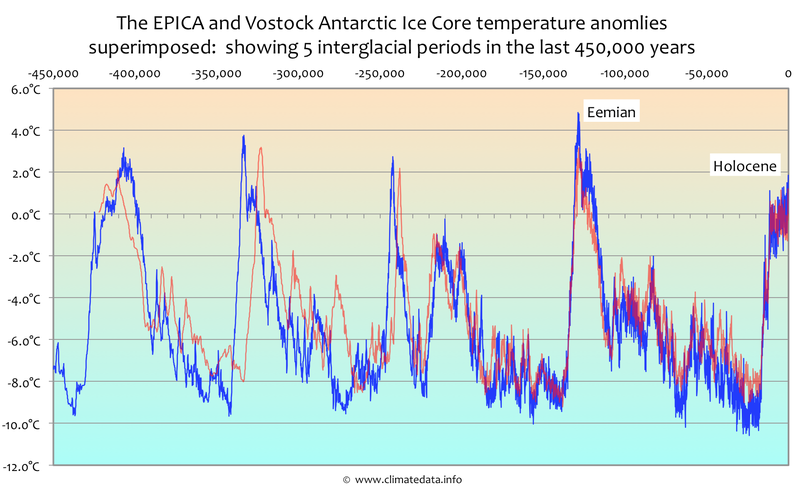 The Eemian interglacial had a much higher peak but lasted about same length of time as the current Holocene. 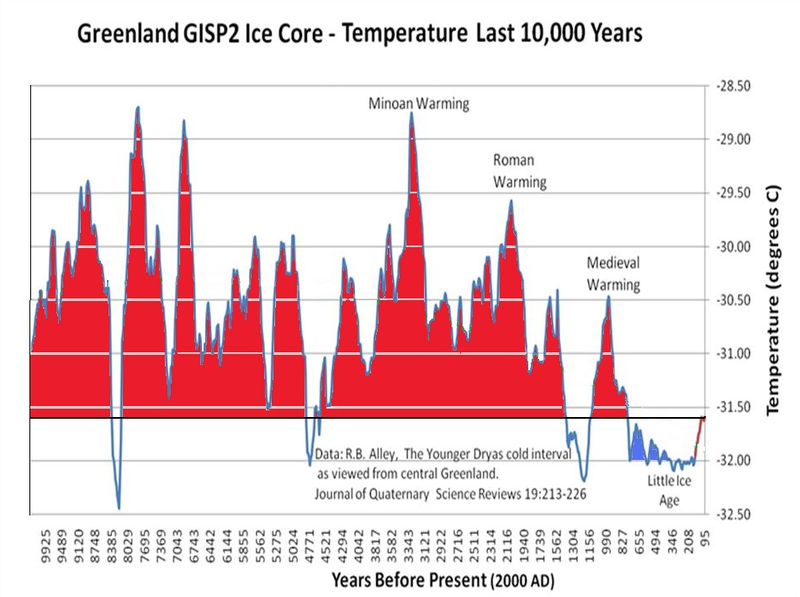 The current Holocene epoch has had significantly lower temperatures and has had a less exaggerated temperature peak than that of the Eemian interglacial. The GRIP Greenland Ice Core record in the Northern Hemisphere also clearly shows the onset of the Holocene interglacial and the onset is well coordinated with the Vostok and EPICA Antarctic records. So based on this pattern of radical climate change our current benign Holocene interglacial could well, our rather should be drawing towards its close. The Northern Hemisphere GISP2 Greenland Ice Core data gives this well accepted detailed profile of our current Holocene Epoch. According to longer term Northern Hemisphere Greenland GRIP ice core records, the last millennium 1000 – 2000 AD has been the coldest millennium of the current Holocene epoch, with millennial average temperatures about 1.8°C lower than its early “Holocene climate optimum” in about 7-6000 BC. There has since been a comparatively minor temperature recovery since the Little Ice Age some 2-300 years ago. However, it is this limited recovery in temperature that has recently given rise to the “Great Global Warming Scare”. The overall millennial difference during the Holocene since ~8000BC has in total been a cooling of ~-0.9°C. The bulk of that temperature loss ~-0.4°C has been in the last 3 millennia since 1000BC. The temperature progress of the current Holocene interglacial epoch for the last 10,000 years is interesting as a backdrop or gauge for all the recent Warmist and Alarmist predictions that have been developing over the last 40 – 50 years. the early Holocene, encompassing its highest “Climate Optimum”, was relatively stable at the millennial level showing only a modest cooling of about 0.007°C per millennium from about 8000BC up until about 1000BC. thereafter the more recent 3000 year phase 1000BC – 2000AD shows much more rapid cooling at a rate of 0.137°C per millennium, (i.e. at about twenty times the earlier rate). This millennial analysis of the GRIP record is reinforced by the profiles of other Northern Hemisphere ice core records, on millennial scales as shown below. These other millennial profiles show even steeper declines than the GISP2 record. Judging from the lengths of past interglacial periods, after some 10,000 – 11,000 years the Holocene epoch should now be drawing to its close. A climate reversion in to a full, encroaching, glaciation is therefore foreseeable, if not overdue, in this century, the next century, or this millennium. So the most recent 3 millennia have experienced accelerated cooling. A continued natural climate change towards a colder climate is now more rather than less likely. Cooling will lead to more intense and adverse weather. There is good reason to expect this, simply because the overall energy differential between the poles and the tropics can only be greater with cooling and that in itself would lead to less stable conditions in the atmosphere. In addition to more adverse weather, any coming cooling will also lead to very serious deprivation for mankind and the biosphere as a whole. Growing seasons will shorten and less arable land will be capable of crop production. There is clear evidence of this form of detrimental climate change with the cooling during the Little Ice Age. In Europe that was a time of great pestilence, social upheaval and failure of civilised settlements, for example in Greenland, due to that adverse colder climate change. A further contemporary example was the demise of the Ankor Wat civilisation in Cambodia, which occurred from the drier cooler climate of the Little Ice Age. But during the last two centuries the world has been recovering from these adverse conditions and the marginal rise in temperature the late 20th century has been wholly beneficial for mankind and the biosphere. As global temperatures have already been showing stagnation or cooling over the last nineteen years or more, the temperature record can be brought up to date with local UK temperature information . The UK’s own long established temperature record is the UK Meteorological Office Central England Temperature record. Since the year 2000 it shows a significant cooling trend at -0.0193°C/year or a decline of about ~ -0.3°C in the last 16 years with colder temperatures both in spring and in summer. Alarmists always consider that their view of a warming trend will continue indefinitely. However were this UK Met office trend to continue to 2100, the result would be a cooling of almost -2.0°C by the end of the century: that would certainly be entering Little Ice Age Territory or worse. But in the period since the year 2000, according to data released by BP, an additional ~2/3 of the cumulative CO2 Man-made emissions since 1965 have been released. When rescaled to exclude the seasonal temperature excursions, the recent annual UK declining trend becomes more obvious. is this what the beginning of a reversion to a Little Ice Age looks like? Especially with the present reducing Solar activity, significantly reduced temperatures, at least to the level of another Little Ice Age are already predicted for later this century. But all current Climate Change discussions and alarmist propaganda only concentrate on short term temperature variations since about 1850, (the recovery from the Little Ice Age). Often these are dependent on very minor, short term temperature increases. These always try to emphasise ever increasing global temperatures. They are often presented as disaster but they are only measured in virtually undetectable one hundredths of a degree Centigrade. The predictions of Catastrophic Global Warming by alarmists should be set in the context of the temperature picture of the current Holocene interglacial. When the predictions of Global warming alarmists are seen in the overall context of the Holocene epoch the much vaunted and much feared “fatal” tipping point of +2°C can be seen to only bring Global temperatures to the level of the very congenial and productive “Roman warm period”. And that further rise of +2°C could only bring positive economic benefits to the bulk of man-kind especially in the Northern hemisphere. Catastrophic Global Warming alarmists postulate that temperature rise will reach the “potentially horrendous” level, (in their view), of +4°C by from the inclusion of major positive feedbacks from additional water vapor in the atmosphere. Even so the +4°C temperature level would still only bring global temperatures only up to about the level of the previous Eemian maximum. The Eemian interglacial ~120,000 years ago, was a warm and very plentiful period in the world’s history: hippopotami thrived in the Rhine delta. As on-land ice sheets receded substantially in the Eemian, the resulting sea levels were about 3 meters higher than at present. But the ice sheet disintegration process to achieve that would have taken several millennia to have been fulfilled. However according to the Alarmists all their radical and destructive consequences of temperature increases are supposed to occur over in this century 2000 – 2100AD. And according to them this “overheating catastrophe” will be solely attributable to Man-kind’s burning of fossil fuels and emission of extra Carbon Dioxide into the atmosphere. Excess CO2 from burning fossil fuel was certainly not the cause of the much higher Eemian peak ~120,000 years ago. and there has been no perceptible increase in Global temperature. aggressively assert absolute catastrophe from excessive Man-made temperature rises. It is extreme arrogance to expect that the actions of mankind could ever achieve a complete reversal of the world’s climatic cooling progress of the last 3000 years and in addition achieve a positive +4°C change over the course of the current century. When the postulated warming in the coming century as promoted by the IPCC and other Global Warming alarmists is collated against the progress of actual Holocene temperatures, the absolute implausibility of the Man-made Global Warming hypothesis by adding comparatively marginal amounts of CO2 to the atmosphere becomes obvious. that any action taken by Man-kind is unlikely to make any difference whatsoever. Were the actions by Man-kind able to avert any warming they would eventually just reinforce the catastrophic cooling that is bound to return very soon in geological time scales. This entry was posted in Uncategorized on June 1, 2015 by edhoskins. Thanks, Ed Hoskins. This is a very good article, with superb graphics presenting a very wide perspective. I have placed links to it in my climate and meteorology pages. That is abject nonsense. Both carbon dioxide and water vapor are greenhouse gases and simultaneously absorb outgoing infrared radiation. The difference is that there is ten times more water vapor than carbon dioxide in the atmosphere. It is their cooperation that counts and only MGT (Miskolczi greenhouse theory) can handle it correctly. According to MGT atmospheric water vapor and carbon dioxide form a joint optimal absorption window in the IR whose optical thickness is 1.87. The latter value is calculated from the radiosonde measurements of NOAA that go back to 1948. If you now add carbon dioxide to the atmosphere it will start to absorb IR just as the Arrhenius greenhouse theory says. But as soon as this happens, water vapor starts to diminish, rain out, the original optical thickness gets restored, and no warming predicted by Arrhenius takes place. This just happens be the description of the hiatus, a stoppage of warming, that we are living through today, Arrhenius wrongly predicts warming at the same time and earns itself a place in the the waste basket of history. With that, the hope of alarmists that water vapor will help them dies. Clearly the influence of water vapor on warming is negative, not positive as they think, and no warming by water vapor is possible. We ARE in that cooling phase, Ed. We have been in it for thousands of years. The Holocene might have looked a lot more like the Eemian if the Younger Dryas had not punched a hole in it just before or at the peak. The Younger Dryas was probably caused by one or a cluster of meteor showers. As though it was not bad enough that political bias drives research funding, a fundamental assertion by EPA results from a mistake in logic. The EPA calculation of the GWP of a ghg erroneously overlooks the fact that any effect the ghg might have on temperature is also integrated over the “lifetime” of the gas in the atmosphere so the duration in the atmosphere ‘cancels out’. Therefore GWP, as calculated by the EPA, egregiously miscalculates the influence on average global temperature of greenhouse gases. The influence (forcing) of a ghg cannot be more than determined by its concentration. The influence on average global temperature of a ghg molecule depends on how many different wavelengths of EMR the molecule can absorb/emit. Water vapor molecules can each absorb/emit at least 170 different wavelengths in the wavelength range of terrestrial radiation (p 499 of http://articles.adsabs.harvard.edu//full/1938ApJ….87..497E/0000499.000.html ) compared to only one for CO2. There are about 30 times more WV molecules in the sea level atmosphere so it is at least 170 x 30 = 5100 times more likely that EMR absorbed by CO2 and thermalized will be reverse-thermalized to water vapor. Great article; I really enjoyed reading it. I hope this kind of information will start to dominate the public and a full understanding of our planet’s climate can be understood.